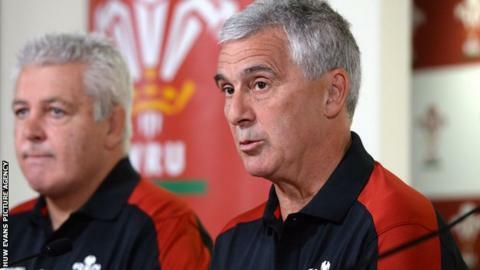 Welsh Rugby Union (WRU) chairman Gareth Davies is hopeful more players will sign national dual contracts in "the next few days". Ospreys and Wales pair Alun Wyn Jones and Rhys Webb are in talks about their dual deals which expire at the end of the season. Toulon full-back Leigh Halfpenny has been touted for a return to Wales, with Scarlets among his potential suitors. "There should be good news," Davies told BBC Wales Sport. "If there's a chance to get players like Leigh Halfpenny or if we have to look to keep players like Alun Wyn Jones in Wales, then we have to consider that seriously. "I do not want to say too much at the moment but maybe there will be good news over the next few days." Ospreys: Alun Wyn Jones, Dan Biggar, Dan Lydiate, Rhys Webb, Scott Baldwin, James King, Rory Thornton, Dan Baker. Newport Gwent Dragons: Tyler Morgan, Hallam Amos. Wales scrum-half Webb is eager to extend his dual contract despite receiving offers from English and French clubs. His half-back partner at regional and international level, Dan Biggar, became the first Welsh player to renew his dual contract on 4 December. Wales have 17 dually-contracted players and another of those, Ospreys captain Jones, has said he is "weighing up" his options. Dual contracts are 60% funded by the WRU and 40% by the regions. While the WRU is in negotiations to keep its leading players in Wales, its funds are also used to bring players back from foreign clubs. Wales centre Jonathan Davies is rejoining Scarlets on a dual contract from French side Clermont Auvergne at the end of the season, and he could be joined by Halfpenny. The 27-year-old joined Toulon on a two-year deal in 2014 and has been linked with a move to Scarlets, Wasps and former club Cardiff Blues.